Friday morning I went to a breakfast sponsored by WAND where Ellen Goodman interviewed Congresswoman Niki Tsongas. Niki spoke about taking advantage of doors that opened just ahead of her and how opportunities may come by chance but we choose to take advantage of them. When asked about her legislative priorities she said her top priority was battling sexual assault in the military. She has been told by women in the service that some fear their male colleagues more than they fear the enemy. The aggressive environment seems to exist in the service academies and every branch of the military. Disturbing. Then after work I rode the Acela down to New York and had a late dinner at Artisinal before turning in for the night at Carlton on Madison. I was in the city to attend Catherine Orenstein's seminar: How to write to change the world? I also managed quick stops at Bryant Park, School Products and M & J Trimmings, but the class was really the standout. I implore all of my smart, witty, excellent women readers to take part in this workshop as soon as possible. At work we examine the reasons women do not run for office and I was amazed that the very same language is used by women who think they are not qualified, bold, talented enough to be part of the public discourse. We say that women often need to be recruited, so consider yourself asked! At the very least, go to the website and poke around the links. They are very generous about sharing resources. The Op-Ed Project—featured by The New York Times, Katie Couric and The San Francisco Chronicle—is an initiative to expand public debate, with an immediate focus on enlarging the pool of women experts who are accessing (and accessible to) the nation's key opinion forums – which are a gateway into public debate, a hub of thought leadership, and feed all other media – and are overwhelmingly dominated (85%) by male voices. See testimonials, sign up for upcoming seminars, or contact us to schedule a seminar or keynote for your organization. HOW TO WRITE TO CHANGE THE WORLD: The Op-Ed Project Seminar (open to the public, women only). In this seminar you will learn how to make a bold, fair, persuasive case for the ideas and causes you care about. You'll learn how to generate winning ideas, craft a powerful argument, use news hooks, address potential critics, pitch ideas, preach beyond the choir, think bigger and make a bigger impact on the world. This seminar is not just about writing op-eds, it's about empowering you to find your voice and make a difference. To register, go to www.theopedproject.org. Colette Patterns Makes me wish I had a sewing machine. Boston Localvores looks like it will be a great resource for area folks interested in the "eat local" movement. I spent two hours seaming my Marlo sweater last night and maybe have another 1/2 hour of work before I can proclaim it finished. Look for photos soon! The Senate is expected to debate and vote on the House-passed Lilly Ledbetter Fair Pay Act (H.R. 2831) this week. In honor of Equal Pay Day this Tuesday, April 22, please help encourage your Senators to not only vote for this bill but to convince their colleagues to vote in support of this essential effort to restore women's right to fair pay. Today, Tuesday, April 22, is the national observance of Equal Pay Day, the day when women and men around the country recognize the wage gap between working women and men, and offer remedies to address pay inequity. According to statistics released in 2007 by the United States Census Bureau, women are paid, on average, 77 cents for every dollar their male counterparts are paid -- a gap of 23 cents. There were 70.2 million women aged 16 and over in the workforce in 2007, a significant increase from 18.4 million in 1950. In 2007, women comprised 46 percent of the labor force. With more women in the workforce, and more families reliant upon women's paychecks for their livelihood, the US must address the wage gap for the sake of American families and their financial stability. Second, employers must examine and correct their pay practices. Employers can get help in examining their pay practices through equal pay self-audit guidelines from the US Department of Labor. Third, women must stand up for equal pay and for themselves. If a prospective employer cannot show that women and men are paid equally for the job you're seeking, it makes sense to look elsewhere. Positive signs includes a hiring process that seeks diversity through affirmative action, written pay and benefit policies, job descriptions and evaluation procedures. A union for workers is another good sign. Women in unions earn 35% more than women in non-union workplaces. Women who are paid less than men must discuss the problem with their employer. If there's a union ask their help. If discrimination persists, file a complaint with the local or state fair employment agencies or with the U.S. Equal Employment Opportunity Commission. Pay equity is a growing national movement. States around the country are introducing pay equity legislation and women continue to recognize the importance of this legislation. Pay inequity penalizes families especially during times of economic hardship so we must address it when trying to boost the economy. At the rate we are going, the wage gap will not close until 2057. Women and their families cannot afford to wait that long! Anyone work for Oxfam in Boston? This Saturday and Sunday I will be riding 150 miles from Woburn, MA to Biddeford, ME. Rain or shine! 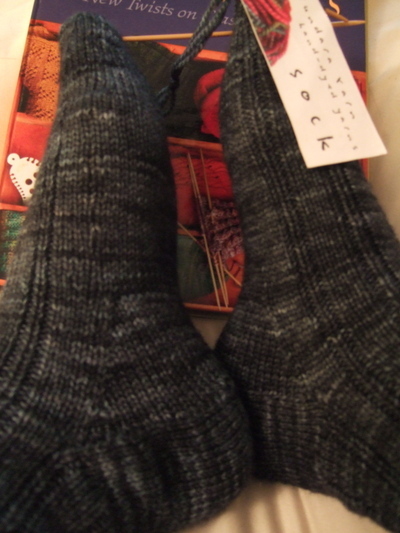 I want to thank all my knitting friends who helped me with fundraising. My connection to diabetes is probably similar to many Americans. My maternal grandmother developed the disease in her fifties due to poor diet and exercise. Over the past 15 years I've watched my father take part in many clinical drug trials in an effort to manage his symptoms of the illness. Fortunately, public awareness is increasing and many are finding how to prevent Type II diabetes. I'm glad to help fund continuing research and get us closer to a cure for juvenile diabetes and other forms. You can help by supporting my fund-raising efforts with a contribution in any amount. who are affected by diabetes and another 40 million who are at risk for developing diabetes. by simply clicking the link at the bottom of this message. can be found at the Association's Web site, www.diabetes.org. To find out more information on our Tour de Cure, please visit tour.diabetes.org. please cut and paste the entire link, from beginning to end, into your Web browser and hit return. Thanks for your friendship and generosity. Here's an article from the Boston Globe about the Young Somerville Advisory Council. I'm looking forward to meeting everyone next week! times more applicants than we could accept. As a result we faced an extremely difficult selection process, and we are delighted with the passion and enthusiasm portrayed in your application. You should be proud that you have been selected to represent your fellow Somerville residents. and create a network of young people that spans the city. As a member of the committee, you will be expected to attend monthly meetings and help us select and implement projects that arise throughout the year. You will also be invited to numerous city and community events, though these are not required. I hope that you will accept our invitation, as I believe the committee, and the city as a whole, will benefit greatly from your participation. Thanks for your interest and congratulations once again. Mayor Joe is enthusiastic to hear your feedback on key policy issues and he welcomes your participation in this group. I'd like to publicly thank Chris & Debby for being the first to contribute to my Tour de Cure fundraising effort. I'm especially grateful because it was Chris' plan to ride 210 (!) miles and raise $2,000 for IBD awareness and research in this summer's "Get Your Guts in Gear" 3-day ride that has inspired me to take on the New England Classic challenge. Please visit their sites and support finding a cure for Chris' [and Charlie-cat] disease. My connection to diabetes is probably similar to many Americans. My maternal grandmother developed the disease in her fifties due to poor diet and exercise. Over the past 15 years I've watched my father take part in many drug trials in an effort to manage his symptoms of the illness. Fortunately, public awareness is increasing and many are finding how to prevent Type II diabetes. I'm glad to help fund continuing research and get us closer to a cure for juvenile diabetes and other forms. Q: What do you want to do when you grow up? A: I want to be a school headmaster. I am very interested in the relationship between creativity and empathy. I believe it is possible to teach students to become "good citizens" via curricula that embraces creativity as a component of all areas of study. As a very basic example, learning foreign languages when young trains the brain to accept multiple truths, which is essential in the development of the creative mind. House, Casa, Maison, Haus, Otaku--all true. Accepting that there are multiple truths allows us to move beyond the restrictions of learning by rote. Art, writing, science, algebra, history...it is clear that even traditional scholastic pursuits can be presented as part of a creative triad: examine, explore, discover. The goal of this method is to develop youth to the best of their individual potential so that they may contribute to the welfare of society. Small acts of kindness as important as responsible stewardship by our elected officials. I took the day off from work today to volunteer for Deval Patrick this Primary Day. Held a sign for several hours and made some Get Out The Vote phone calls. The polls are closed now and reports should start coming in soon. Meanwhile, I have some photos to share. No, not the Central Park hoodie yet. *Deval Patrick has experienced the life-changing potential offered by superlative education opportunities. He has identified the lack of resources dealt to educators in Massachusetts and pledges to help our teachers bring their students to higher levels of achievement and help families afford college. * Deval Patrick has an innovative approach to fixing the housing crisis in Massachusetts. He is the only candidate who will give businesses incentives to offer employer-assistance for down payments on starter homes. His plans to promote transit-based development and energy efficiency demonstrate his broad commitment to sustainability. *Deval Patrick "sees health care as a common good" and is the best candidate to lead health care reform in Massachusetts. He will end the racial and ethnic inequalities in our system. He will cut prescription drug prices. He will work with the legislature for progressive coverage for all residents. I urge you to visit Deval Patrick's website www.devalpatrick.com. VOTE in the Primary Election on Tuesday September 19th. To find out your polling location visit Where Do I Vote .